More than 2 million Australian households have installed solar energy systems in an attempt to drive down their energy bills. It’s no longer unusual to hear people talk about solar hot water or solar power systems and the trend towards greater use of renewable energy within the home isn’t going away. Today, households are embracing solar technology at record rates. 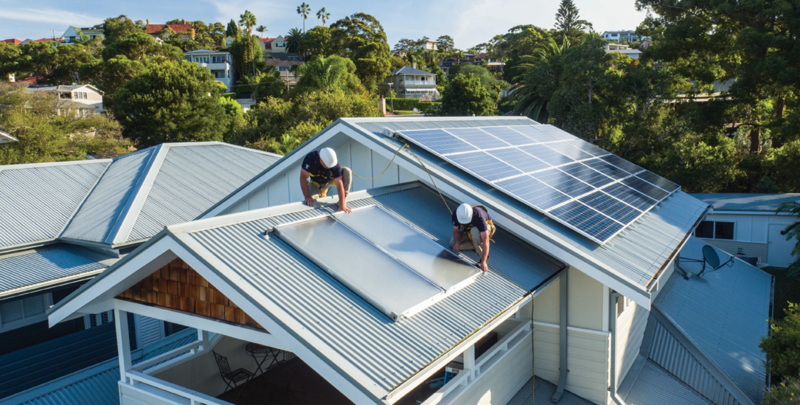 For example, in 2018, 1600MW were installed on Australian roofs, 140% higher than three years prior. In addition to solar hot water and solar power, battery storage systems are becoming more popular. These allow households to store their excess solar energy; however, they are yet to benefit from the same cost reductions that solar power systems have experienced over the past five years. The fall in the cost of solar power systems is also leading households to fill their roof space with more panels to generate as much power as possible. The average size now is 7.8kW, compared to three years ago, where the average size was 5.4kW. Larger systems generally produce excess power which is fed back to the electricity grid, often for little financial return to the consumer. Excess solar energy also causes problems for the grid due to the amount of power being sent back, often when it is not needed. This is where batteries and other energy storage solutions can help, such as an integrated solar-smart electric water heater. A solar-smart water heater diverts the excess solar power not used by a household, into a specially designed water heater. It works with new or existing solar power systems and offers a more affordable solution than a battery. The system still pulls power from the grid if needed (for example, when the sun is not shining) to ensure hot water is always there, but it does this in an optimal way by avoiding peak tariffs where possible. This water heater also has the opportunity to further optimise household energy savings through a Home Energy Management System (HEMS) which could improve the return on investment. HEMS works by ensuring appliances are used at times when there is excess solar energy available, or when there are optimal off-peak energy tariffs. Although research shows the key driver to solar uptake is still to reduce energy bills, Australian households are becoming increasingly concerned about the environment, so this is a growing factor for families making a decision towards a worry-free renewable energy future. ‘Passive Design’ – What’s all the fuss about?